The Wisconsin Badger Chapter of CMAA will provide opportunities for professional and personal development; always seeking to enhance the balance between the two. We promote communication, networking and emotional connection between Badger Chapter members. We cultivate leadership within the Chapter and the club industry while making a positive impact on our families, our community and our country. 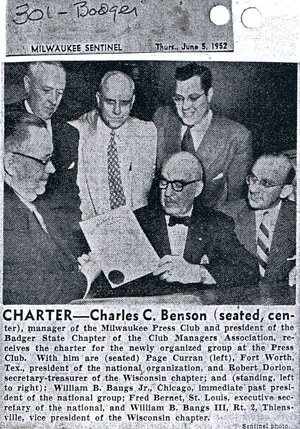 ​The Wisconsin Badger Chapter was established in April 1952 as the Badger State Chapter with 9 charter members. The purpose was to upgrade the profession of club management and to offer its members continuing education. By 1960 the membership had doubled and was still growing. At that point no one could imagine that one day membership would be pushing one hundred. In 1965 they decided to change the chapter name to the Wisconsin Badger Chapter, primarily to be more recognizable and more territorial. Today the Chapter continues the purpose of furthering our profession and offering the best in education to its members. The Chapter now supports its own Foundation (The Wisconsin Club Managers Foundation) with scholarships to students and managers, as well as contributions to charities. The dream of the founders has come true, with advancement to Bigger and Better things a reality, and a desire to continue to do so.